There is absolutely nothing better than a clean, sleek office space for productivity. We’re absolutely in love with the way Lacoya Heggie, Owner and Lead Coordinator of Hello Love Events has decorated her office. With a base of sleek white, and pops of navy, gold, and pink, we’re absolutely in love. 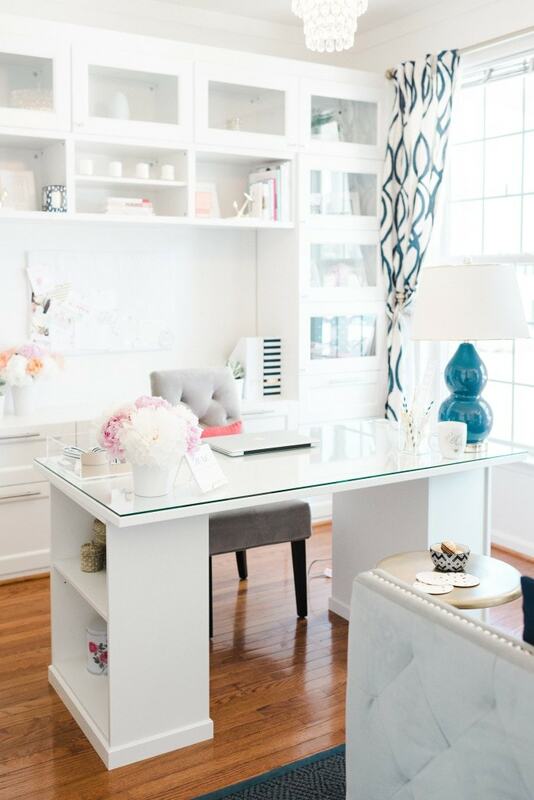 Scroll on for more gorgeous office inspiration, photographed by Andrea Pesce Photography! Hi, I love your office. Could you tell what components you used to make your desk. I have been wanting to make something like that except counter height. (Like a project table.) Looks like a lot of Ikea products. I love your office! I’m in the process of redoing my home office and this is so close to the look I have in mind. Do you have a list or links anywhere for where you got the furnishings? awwwww the link doesn’t work anymore. Where did you get your white cabinets from? I am looking for a desk and the cabinets like what you used, can you please tell me where, and if you can put regular sized filed in them along with Legal? Were you able to find this desk at IKEA? I see it in grey but would love to find it in white! Here is a link with the details of the furnishings. Can you someone provide the link to these cabinets?